Swimming pools are great for providing refreshing relief from the hot summer sun, but if you are not careful, it can also be dangerous. Drowning is the second-leading cause of death in children under 14 years old and claims more than 7,000 lives annually. When cooling off in your backyard pool this summer, use the swimming pool safety tips below to prevent accidents and drowning. No matter what your age, it is time to learn how to swim if you don’t know how! Learning how to swim can save your life and that of swimmers around you, plus give you far more confidence when you’re near the water. 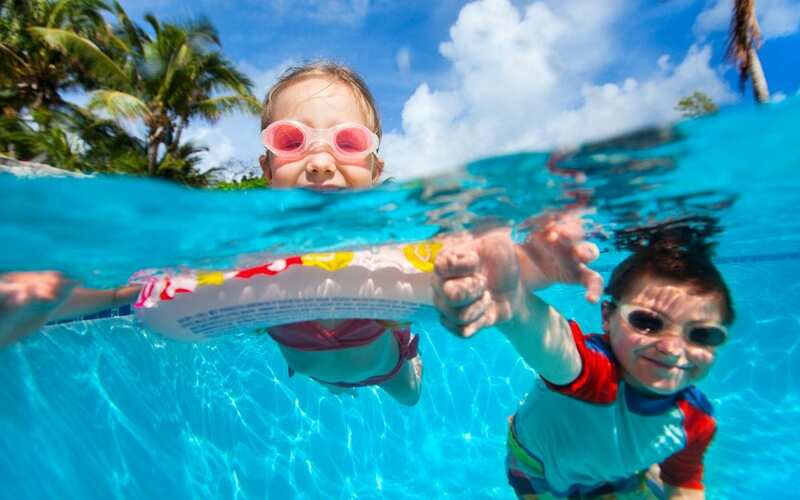 Many free and low-cost swimming classes can help you or the kids learn how to swim. Take advantage and make this the last summer you aren’t enjoying the water, too! Most states require the installation of a four-foot tall fence around any pool to secure the area and protect against accidental falls into the water. However, do not stop with fence installation because it is not foolproof. Pool alarms are affordable and provide an added layer of protection and comfort when kids and others are out in the swimming pool. These alarms notify you when anything comes within a certain vicinity, usually 15 feet, of the pool. Hire a certified pool inspector to inspect your home’s swimming pool, looking for any signs of damage or dangers that could threaten the safety of people using the pool. It is reassuring to know that your swimming pools safety and cleanliness features are operating properly. Never take your eyes off children playing in the water, especially younger kids. Looking or walking away from the pool area for even a few short minutes could prove fatal. Remember, it takes just 1 minute for a struggling person to become submerged, and only 3-4 minutes for a person to drown to death. Floating devices and a crooked rescue hook are two very important pieces of safety equipment that you need to have poolside before anyone gets in. There is an assortment of additional safety equipment that can help out should there be any danger. Make sure all of these items are on hand. Nothing is more exciting than enjoying the water when the weather is hot outside, but safety should always be first in mind. Water can be dangerous if all of the proper precautions are not taken. These simple swimming pool safety tips are designed to keep everyone safe while enjoying the water. Make sure to keep this information in mind all summer long so that your friends and family stay safe in your pool. Lakeland Home Inspection Service provides pool inspections and other home inspection services to Lakeland, Florida and the surrounding areas. Contact us to schedule your appointment.